A tiny piece of fish bone trapped on throat can cause discomfort or pain because it normally feels like it is cutting from the inside. It is always best to have a ready remedy to remove the clog and ease your throat. Drink water in large gallops, it helps wash down the trapped fish bone. Eat rice or banana. Just don't chew too much so the fish bone has something to stick onto. According to Chinese, one best way is to gargle with vinegar because it can soften the fish bone. Swallow small chunks of bread. 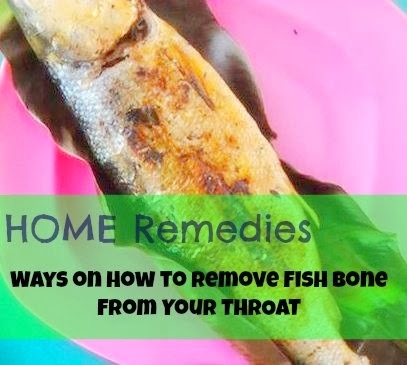 It can help dislodge the fish bone, this works for me the best more than any other home remedies. This really works for me and also with my son. Use any sharp objects like scissors or tweezers to get the fish bone. Chances are you might hurt yourself and the small cut can lead to most serious infection. Never poke your throat even with your fingers, you might just move it deeper. The very best advice you can take is ask for a professional help. Doctors have complete equipment they can use to locate and pull the fish bone that can cause infection.